As you set sail on your voyage of the wedding planning journey, there’s probably no more romantic a setting for your wedding ceremony than a pristine beach….and none more so than an elegant beach wedding in the Whitsundays. Feel the breeze in your hair, the soft sand between your toes and proclaim your love for one another against a tropical backdrop with the only sound the gentle lapping of the waves on the shoreline. Be the first footsteps of the day on an uninhabited island or make the most of the first class facilities at one of the many resorts with their own beaches – the options are as endless as the horizon. The resort town of Airlie Beach is the vibrant hub of the mainland with a wide choice of beaches within a 10 minute drive. If you don’t mind an audience then the small bay of Airlie Beach itself is a quintessential North Queensland strip of sand, fringed with swaying palms and the atmospheric sounds of the main strip. If you are chasing a little more privacy then the South end of Boathaven Beach is a popular choice for brides who want to remain close to town for the convenience of their guests, but want the extra privacy that this beach offers. A local gem only a short 5 minute drive from Airlie Beach is Cannonvale Beach. This is the locals choice for a beach wedding. This tidal beach offers spectacular views back to Abel Points Marina and beyond to the Coral Sea. 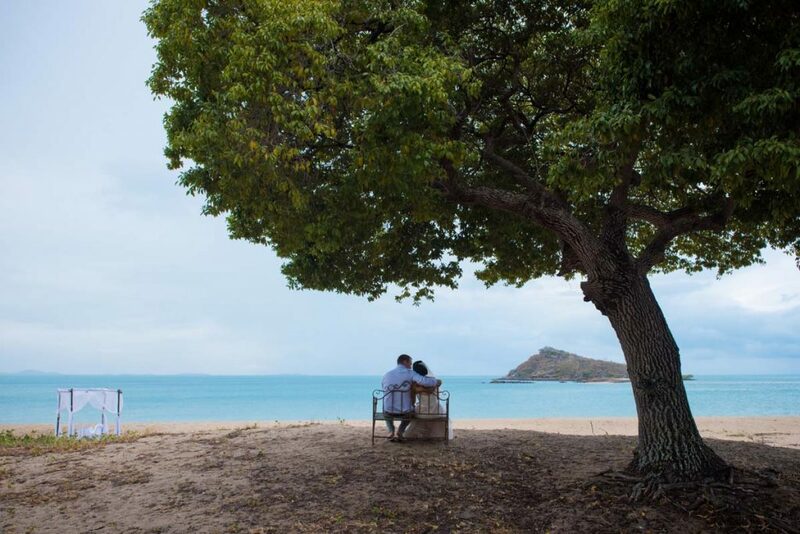 Fringed with parklands and offering ample parking, Cannonvale Beach is your option if you want a quick, no fuss beach ceremony so that the real part of the wedding celebrations can begin. If you feel like exploring the region, there are stunning beaches located a 45 minute drive to the north of Airlie, including the many tropical beaches along the coastline of Hydeaway Bay, Bowen and beyond. 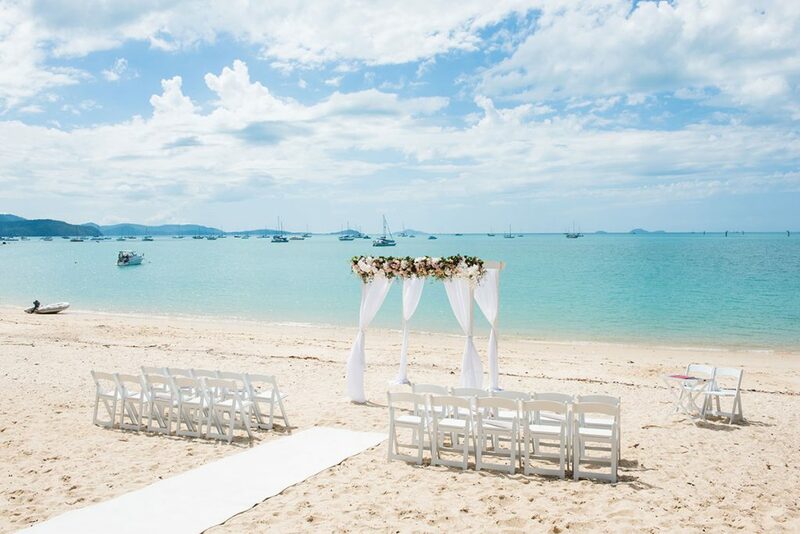 These beaches require a little more logistical work than those closer to Airlie Beach and we suggest working with a local Whitsunday wedding planner to help make your dream beach wedding a reality. Without a doubt, the beach that the Whitsundays is most known for is world famous Whitehaven Beach. This spectacular stretch of pure white silica sand and turquoise ocean will take your breath away. Located on Whitsunday Island – this seven kilometres of dazzling white sand backs onto natural bushland and looks out to the most magnificent tropical hued sea. It has played set to international events, exclusive photo shoots and is all yours, whether it be for an elopement, an intimate beach wedding or a beach wedding reception for 200 guests. 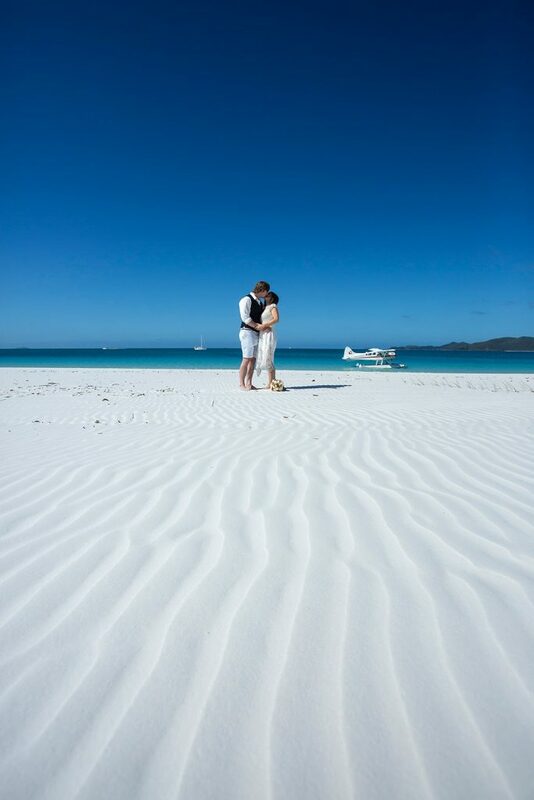 Due to its location on an uninhabited island the only way to have your Whitehaven Beach wedding is to travel via air or sea. See our list below for local operators who can help with your transfers. 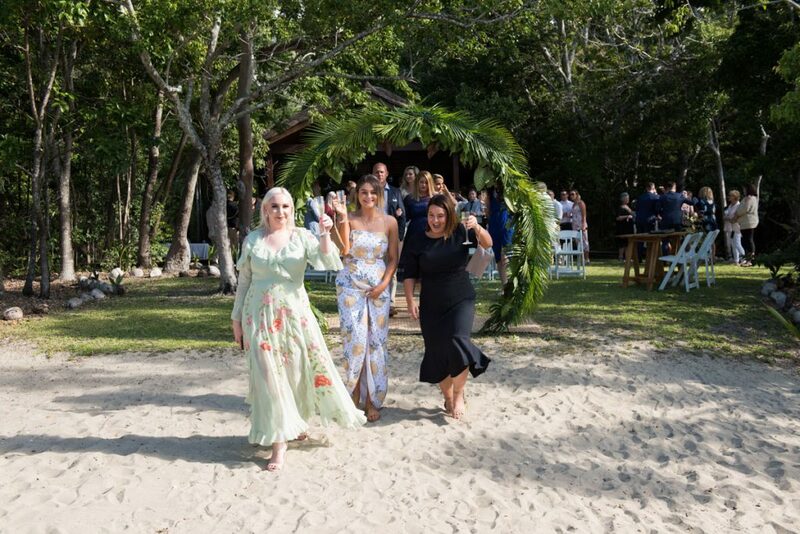 If you’re dreaming of a tropical island beach wedding but want somewhere you can settle into with your guests and treat them to a complete experience then you have to check out Palm Bay Resort. 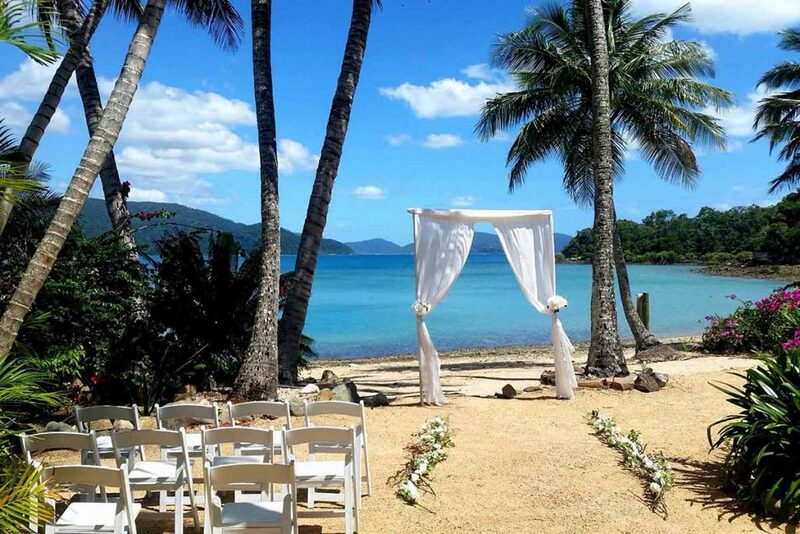 Tucked away in the calm aquamarine waters of Long Island Sound, Palm Bay Resort is very much a secret to the outside world and as the only dedicated sole use resort in the Whitsundays it is a truly memorable destination for your beach wedding. Imagine exchanging vows on your own private beach, a seaplane entrance, ukulele serenade and a sumptuous moonlit feast under the stars. The resort can accommodate up to 46 guests in 23 private villas and is the perfect setting for your intimate wedding in paradise. If you have a larger guests list or simply want more activity and accommodation options, but still have your heart set on an island wedding check out Hamilton Island. 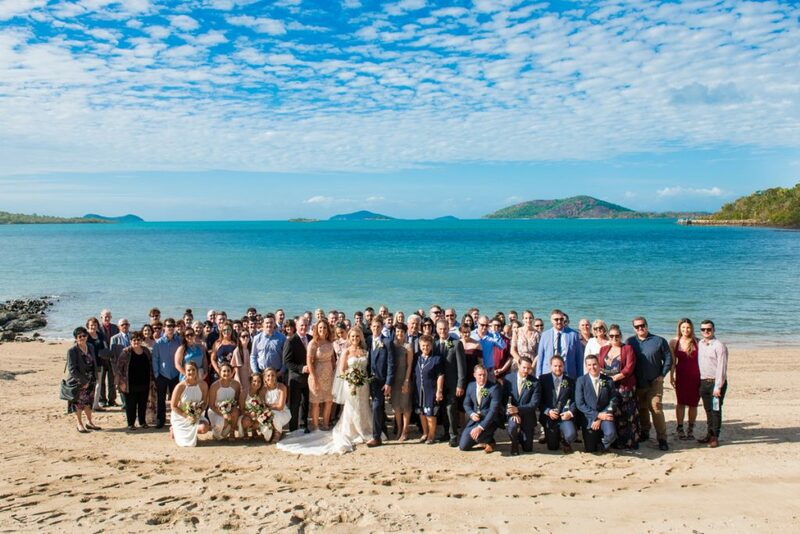 The Whitsundays largest island resort offers stunning Catseye Beach as the island’s most popular and iconic outdoor ceremony location. Boasting one of the most tropical settings found in the Whitsundays, Catseye Beach is your choice if you want an island resort wedding package without travelling to Bali or Fiji. Hamilton Island have an in house planning team who will help with all aspects of your wedding day including how to pick the best time of year for your island beach wedding in the Whitsundays. If you are after a truly private beach wedding in the Whitsundays then you have four magnificent locations to choose from including Earlando Resort, Paradise Cove and Villa Botanica. All venues are private estates, each with their own stretch of coastline that is exclusively yours on your wedding day. All of these venues have their own space for a private beach wedding and offer very different style settings so be sure to check out their listings below for images and descriptions. And if your heart is set on a beachside wedding but you feel overwhelmed by the logistics of it all – never fear! 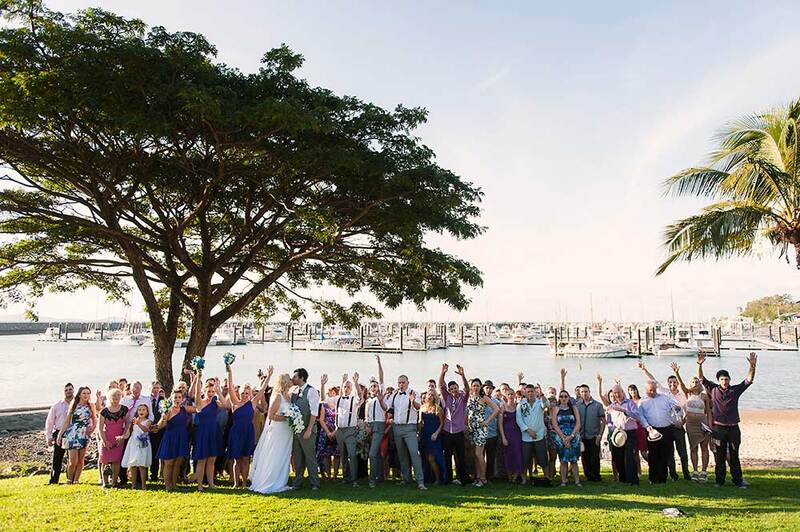 The Whitsundays are home to several excellent wedding coordination and planning companies, who will assist you with every aspect including boat transfers and permits, if required. There are also clever and creative stylists and wedding decorators, who will make the most of the stunning Whitsunday setting and bring your vision to life on your special day. Choose from flesh floral arbours with white chiffon draping for a soft elegant style and a little added shade for the bride and groom. 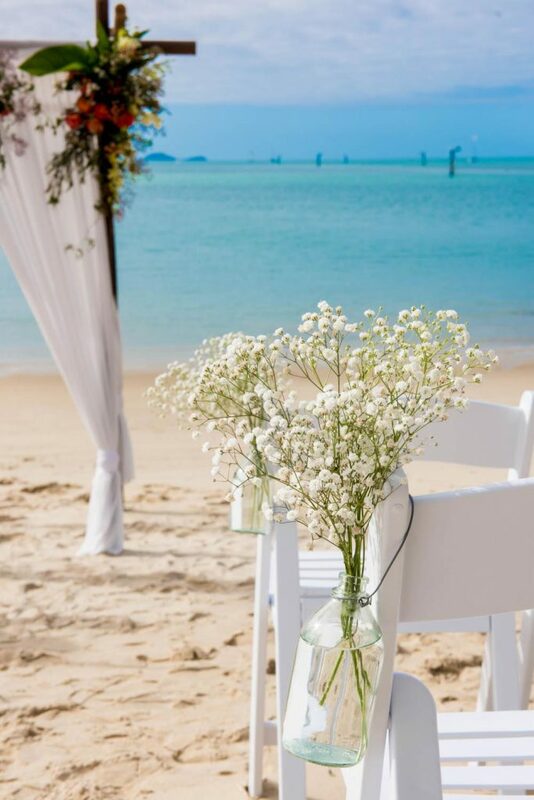 Decorators can take care of the entire set up on the day, including chairs, aisles and decor and drink stations so that your beach wedding ceremony is ready and as comfortable as possible for your elegant beach wedding.